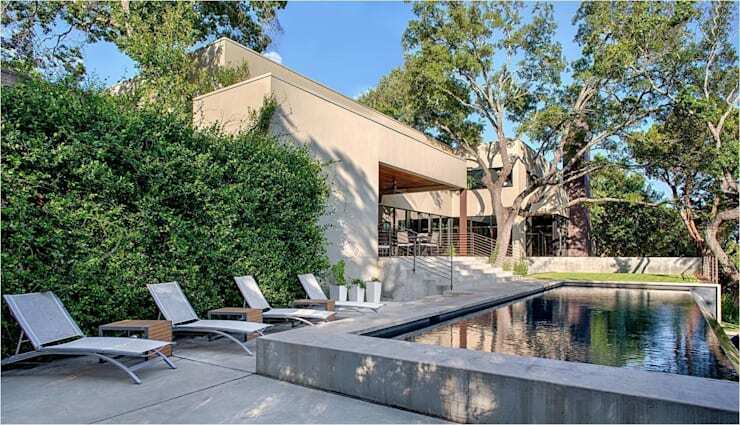 Welcome to the West Lake Hills Residence, situated in Austin, Texas. 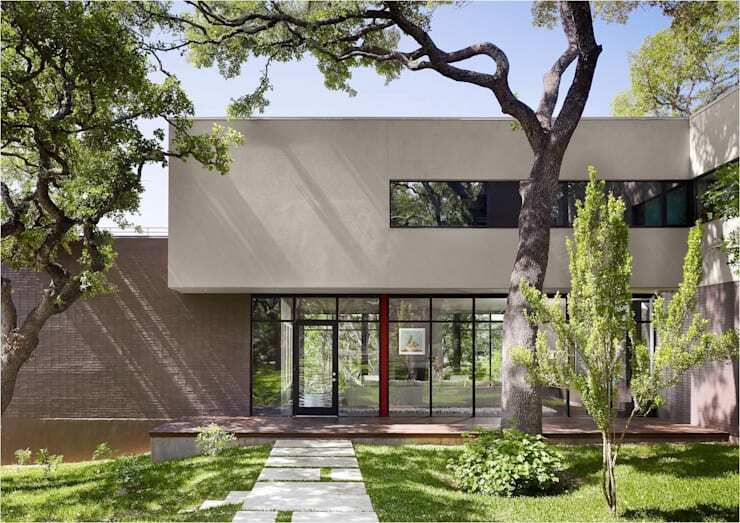 This striking and bold home was imagined and brought about by the distinguished American architects, Specht Harpman with the goal of accommodating the ancient oak trees on the property, and integrating the design with its surroundings. The structure of the house weaves around the trees and is enveloped in the shade of its canopy. The natural influence of the house's surrounds is clearly evident in it's design, with its homage to earthen elements and assimilation with the environment around it. Join us for a journey around and in this spectacular house, since it can be assured that the interiors are as impressive as its façade. Let's take a look! The façade of this contemporary design is the epitome of modernism. The large cubic structures that constitute the building are held up by cantilevers which contribute to a robust ensemble that is brought into balance by the colossal windows used throughout the design. The force that the concrete as building material brings to the building manifests a strong presence as an equal amongst the resilient oak trees that dominate the space. In its entirety, it is an edifice that can holds its own in the environment while paying respect to its natural surroundings. Coming round the back of the house, we are greeted by a luxurious infinity pool. Large concrete slabs create space around the pool area filled by convenient recliners. There is a well-kept lawn bordering the swimming section, allowing for many recreational activities in the back yard. A tall, prominent oak tree guards entry to the house and signifies the boundary of the lawn. This ancient sentry does not only provide strategic shading, but also a pristine natural aesthetic right on the back doorstep. A large and luscious hedge borders the house and creates a barrier of privacy for the pool-side area. This adds to the greenery in the design and effective use is made of natural elements to fulfil the needs of the structural space. Now we get to see what's inside. 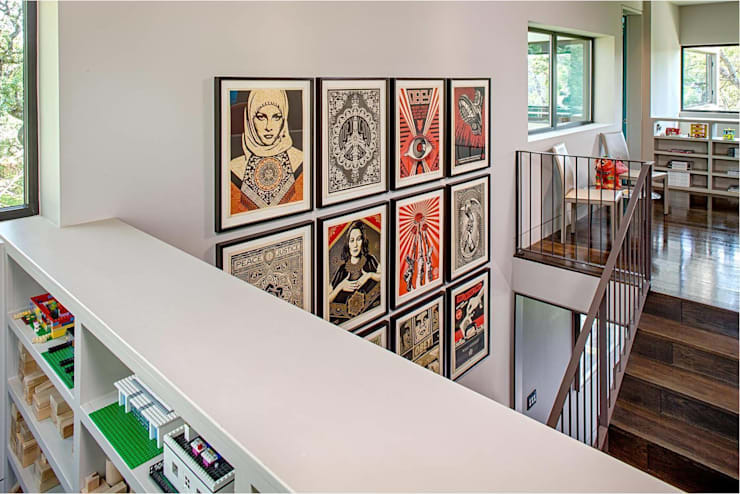 The hallway is filled by contemporary, framed prints with form a striking art piece as a collective. These very large prints make light of the massive space which it had to fill. The eye-catching, bold and schematic colours suit the realistic images and create a focal point in a space that transcends different levels of the home. The tiled usage of different images bring much more interest than would a large statement piece filling the entire space. It seems that this home has an underlying theme of impressive and striking features, inside and out. We come to find ourselves in the living room. The larger-than-life window panes that form the entire front-facing wall of the house immediately infuses the outdoor environment with life inside the house. It is fitting for the relaxed and comfortable setting of this living space, since it provides uninterrupted views of the lovely trees outside. The statement fireplace ensures that the temperature remains favourable regardless of the visible season outside. It also forms the focal point of the entire room, and the cubic frame around the fire is reminiscent of the entire house's balance between natural elements and bold structures. The furnishings of the living room are well suited to the symmetry of its design, bringing stability by means of dominating neutral colours with tactical use of brighter elements. Next we move towards the kitchen, which is unsurprisingly sectioned off from the exterior by another wall of glass. The repeated use of this material and style supports continuity throughout the structure. 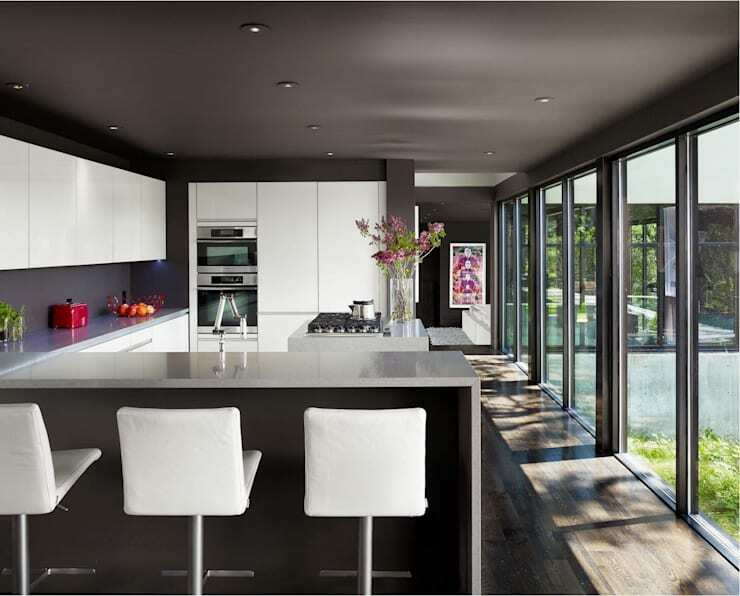 The kitchen is furnished in a distinctive minimalist style with the clear-cut, clean borders between functional kitchen space and the surrounds marked by variance in colour. The positive space created by the use of white for practical areas is a clever way to make the kitchen seem more voluminous, and the state-of-the-art finishes make this anyone's contemporary kitchen dream. Diffuse lighting ensures that the light is well-spread across the area—a theme of balance the runs throughout the house. 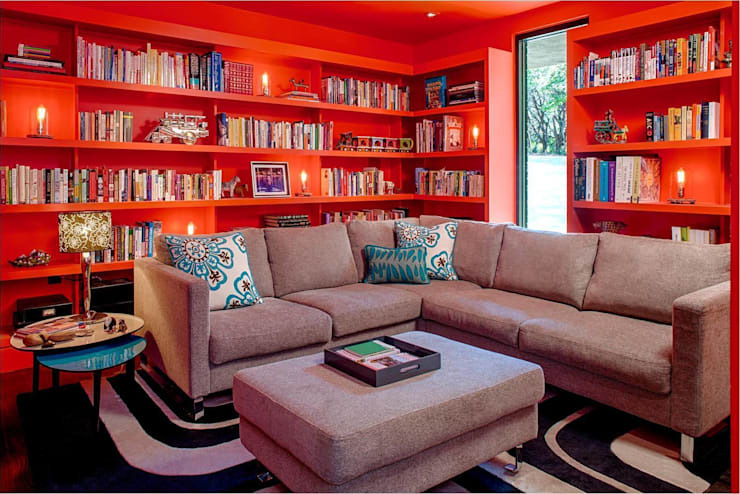 The library or secondary living room is an arresting space. The intense colour of the walls and ceiling transforms it into a playful alcove with much visual interest. In contrast, the neutral furniture centres the purpose of the room and provides visual centring. The blue of the scatter cushions is complementary to the passionate orange or the surrounds, but is subtle enough to leas he eye across the space without making it seem too busy. The large print on the rug is adds another plane of interest which is divided from the warm colour of the walls and ceiling by the neutral furniture, creating layers of depth. 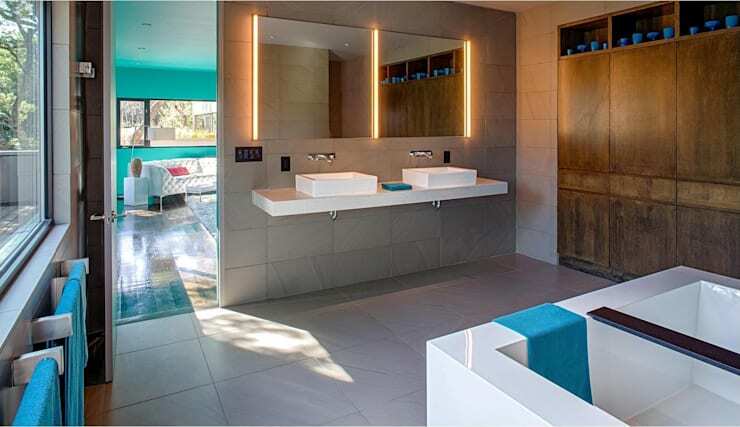 The bathroom of this dignified home is a clear and clean space. The earthen tiles used in different sizes for the walls and floor produces a unity without making it seem disinteresting. The cubic forms of the bathtub and sinks are protégés or the larger structure of the house. We find that the astute LED back-lighting of the mirrors generates a futuristic ambience whilst also bringing warmth into the room. As throughout the home, an exact symmetry is present which is expressed in equal distribution of weight and space in the area. As we come to the end of the tour and out unto the porch, we find ourselves in a convenient niche in one of the box structures which constitute the building. The wooden ceiling is a fitting natural instalment that is well-suited to the theme of the house and the recurring elements throughout its interior. This, in conjunction with soft lighting, creates a warm and inviting setting on the porch which will draw all inhabitants outside and welcome exhausted swimmers back after an active afternoon dip. The stairs leading down from the porch to pool area creates a pavilion style space, promoting a grand atmosphere in this recreational area which is fitting to the mother structure. Being a spectator to the magnificent design of this house is certainly a pleasure, and when it comes to finding harmony between construct and nature, it most definitely takes home the gold. Take a look at another beautiful dwelling by these renowned architects. What is your favourite aspect of the West Lake Hills Residence?